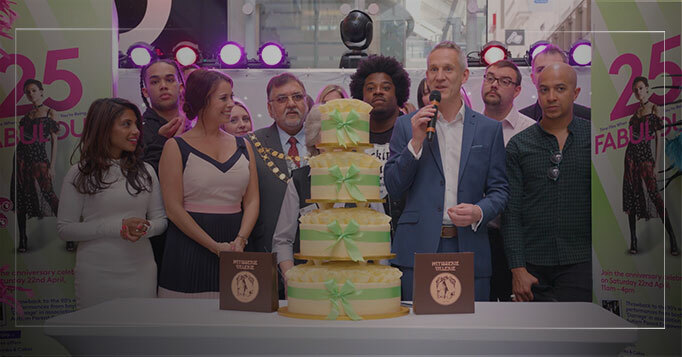 County Mall in Crawley turned 25 in 2017 – not that you would think it from looking at the building – and to celebrate, they threw themselves a birthday bash and invited a big crowd of shoppers down to join in the fun. We were asked to both film the event for the purposes of making a video highlights piece which would feature presenter Jessica Jay telling the story of the birthday celebrations and also to have Jessica to live host the event throughout the day. Shooting coverage throughout the day of all the different mini-events meant we got to shoot a wide range of things including dancers, contortionists, magicians, speeches and 1990s boy band Damage performing live – a big thrill for a massive audience who came to watch. Jessica shot various piece to camera links across the course of the day, each designed to communicate to the viewer what happened and what was there on the day. In-between filming those links, Jessica was also on stage to draw shoppers in to the event and introduce each of the acts throughout the day. This video was the first of a number that we have shot for County Mall throughout 2017 including the Dads Drop Off event for Fathers Day, the Shrunk Shopper summer event and the Faces of County Mall campaign.